Pluralist Universalism critiques U.S. liberal multiculturalism and China’s ethnic policy from the post-Cold War period to contemporary times. On the one hand, the comparison between the two nations’ treatment of ethnic and racial issues reveals the shortcomings of each approach; on the other hand, it maps out the “unexpected continuities and connections between the two projects” (xiii), highlighting both as problematic discourses of multiculturalism that are dependent on one another in order to downplay their own social tensions regarding ethnic and racial issues. However, unlike staunch criticisms of multiculturalism by scholars such as Brian Barry and Sneja Gunew, Wen Jin takes a different approach: she stresses the corrective nature multiculturalism has on unitary nationalism. 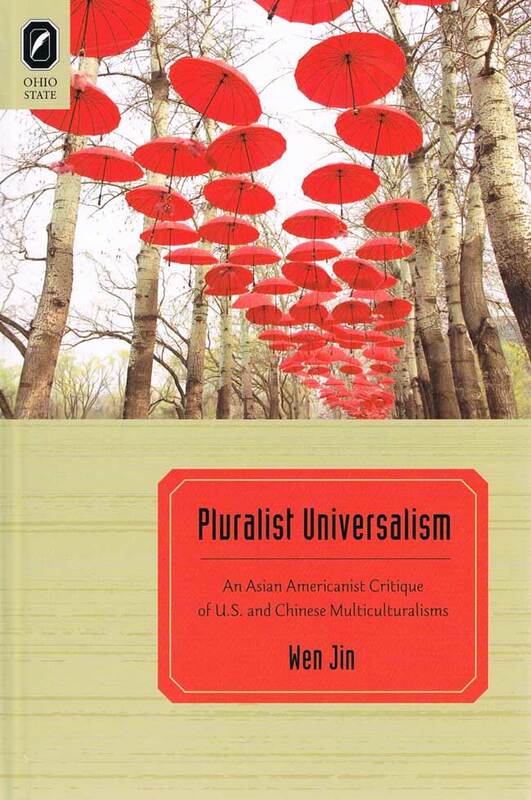 Jin argues that multiculturalism in the liberal U.S. and socialist People’s Republic of China―despite limitations in their ethno-racial policies―has triggered and proffered alternate versions of “pluralist universalism” within their respective societies. In this sense, multiculturalism, if not productive, is at least generative in terms of contributing to many debates and discussions on cultural diversity and social harmony. Furthermore, in her introduction, Jin reminds us that political liberalism, the foundational ideology of U.S. multiculturalism, is merely a particular kind of pluralism that advocates individual rights as the basis of group-specific rights—rights that also exist in societies with different systems or cultural traditions, even in non-liberal ones like China. The introduction lays out the book’s framework and methodology. A transnational and comparative project, Pluralist Universalism examines literary texts produced from the 1990s onwards in the U.S. and China, focusing primarily on Chinese and Chinese American fiction. Jin’s analysis of texts such as Maxine Hong Kingston’s Woman Warrior, Jiang Rong’s (姜戎) Wolf Totem (狼圖騰》), Alex Kuo’s Panda Diaries, Zhang Chengzhi’s (張承志) History of the Soul (心靈史), and Yan Geling’s (嚴歌苓) Fusang (扶桑) shows that the narrative practices in these fictional works ostensibly represent the opposing perspectives of U.S. liberal multiculturalism against China’s ethnic policies. At the same time, however, her approach also highlights overlapping social contexts between the two multiculturalism projects, revealing similarities in ideology and structural shortcomings in both projects. To avoid conflating the effects and implications of multiculturalism in each nation into some sort of universal experience, Jin appropriates Walter Mignolo’s double critique to propose her own methodology of “strategic doubling.” “Strategic doubling,” she explains, “responds critically to the conventional manners in which racial and ethnic issues in the two countries are compared, explicitly or implicitly, in popular culture and official political rhetoric” (9). To push us further beyond the constraints of traditional disciplinary divides such as that of area studies and ethnic studies­—or to be specific in her project, the divide between East Asian studies and Asian American/Diaspora studies—Jin suggests the important role Asian American critics play in “[reconstructing] and [bringing] into dialogue, the various histories and literary and political discourses they address through robust collaborations with both American studies and East Asian studies” (19). Adopting the practice of strategic doubling could help both Asian and Asian American scholars extract greater critical potential from the dialogue created by the collaborations between American studies and East Asian studies as we proceed to rethink the status and future of area studies. Jin’s expansive view on multiculturalism maintains the difference between liberal multiculturalism in the U.S. and the socialist version in China; it attempts to highlight the ways in which the nation-building projects in these two distinct political and social systems impact the lives and social statuses of their particular racial and ethnic minorities. In so doing, the comparison of the two versions of multiculturalism also exposes the political stratagem whereby one nation accuses the other of failing to promote multiculturalism and the welfare of racial and ethnic minorities. As Jin shows, the overlap here lies largely in China’s appropriation of liberal policies from the West while framing it within a Chinese structure, such as the philosophy of Confucianism. This adoption of the American liberal model of multiculturalism calls for rhetorical appropriation as a double gesture that avoids pitting American liberalism against Chinese socialism in terms of their respective approaches to multiculturalism, while highlighting the merit of Chinese values that do not seem contradictory to American liberalism. Chapter 1 introduces the concept of “conciliatory multiculturalism,” a version of multiculturalism both the U.S. and China engage in with official policies and cultural practices distinct to each respective political structure and nationalism. Conciliatory multiculturalism promotes the myth of an easy reconciliation between nation-building agendas and their efforts to surmount inequalities and promote the welfare of ethnic and racial minorities “without radical interventions in the economic, political, and psychic conditions of these inequalities” (37–8). The practice of this version of multiculturalism only further displaces these inequalities under the guise of liberalism in the U.S. and interethnic relations (from ronghe 融合 to minzu tuanjie 民族團結) in socialist China. Conciliatory multiculturalism maintains its influence when a nation state oscillates in its policies and cultural practices, both acknowledging and disavowing ethno-racial struggles. In order for the U.S. and/or China to strengthen the myth of national unity, the past or other nations are often invoked as targets, criticized for their failed practices of multiculturalism. This gesture enables the U.S. and China to contain any potential accusation of racism against them. As a dominant form of official multiculturalism in both nations, conciliatory multiculturalism provides Jin with the grounds for comparison and critique of ethnic-racial policies in China and the U.S. To foreground the ideologies behind Chinese and American conciliatory multiculturalist practices, Jin investigates each through the respective lenses of Chinese and Chinese American literature. The common misconception of “Chinese” as the racial marker for anyone from China or with ancestral links to China has led to the misconstrued understanding of China’s state nationalism as separate from ethnocentric or racialist discourse. Since scholars in Critical Han studies and Sinophone studies have begun to trace the historical construction of such myopic views of race and ethnicity in China, we have come to learn that, as Jin puts it, “the notion of a unitary Han race was invented and mobilized as a rallying point for struggles against the invading European powers and the decaying Manchus (rulers of the Qing Dynasty)” (43). Indeed, ethno-racial diversity and plurality have always been a part of Chinese history. Modern nationhood has forced China to begin addressing issues relating to its diverse ethnic groups and their needs. Conciliatory multiculturalism evolved as China began promoting an official ethnic policy predicated “upon the myth of a symbiosis between the foundation of the party-state and the forging of irrevocable interethnic ties (in addition to China’s prior claims to these areas during the long imperial era)” (53). Similar to the melting pot discourse in the U.S., China has in the past adopted the discourse of amalgamation (ronghe) as its practice of conciliatory multiculturalism. Although China’s ronghe ethnic policies were aborted during the Cultural Revolution, the recent revival of the discussion on interethnic relations—conducted under global surveillance of the state’s conflicted relations with regions populated by ethnic minorities such as Tibet—retains some continuity with past policies but with a shift in its underlying political agenda. Jin notes that “ronghe” has mutated into “minzu tuanjie” in a 2009 white paper on China’s ethnic policies. Minzu conflates both ethnic and national identity into one that carries the reincarnated soul of ronghe. However, the focus on tuanjie (unity) allows China to flank criticisms on its attempt to subsume (ronghe) ethnic minorities under the larger discourse of the Han-centric nationalism. To provide examples of conciliatory multiculturalism in both the U.S. and China and to show how the two versions of pluralism complement the agenda of nation-building in each country, chapter 2 presents a comparative analysis of Jiang Rong’s Wolf Totem (2004) with American novelist Clive Cussler’s Treasure of the Khan (2006). Both novels adopt the post-cold war narrative of situating China and the U.S. as competing empires in the global rivalry for natural resources in the twenty-first century. Coincidentally, in order for them to deflect charges of imperialism, China and the U.S.—both contemporary empires—have invoked the historical Mongol empire as the imperial “other” and accused it of engaging in imperialist exploitations of the natural world. Jin demonstrates how Treasure of the Khan and Wolf Totem adopt conciliatory-multiculturalist rhetoric in their respective narratives, at first acknowledging the imperialist implications of China’s and the U.S.’s foreign and ethnic policies. In the case of Wolf Totem, Jiang even takes a step further to critique China’s domestic policies in Inner Mongolia. However, these critiques of the two contemporary empires are, after all, rhetorical gestures to ultimately reconcile the two polities by proposing that both have the potential to establish or even reclaim some form of utopic pluralist universalism. Such narrative politics in both novels, Jin argues, reinvigorate Chinese muscular nationalism and U.S. liberal nationalism as opposed to imperialism—which they are often accused of—by “casting ethno-racial tensions within a state and, by extension, cultural and ideological conflicts between states, as having always and already been reconciled under a form of liberal or measured nationalism” (73). In the case of Wolf Totem, Jin points out that Jiang’s proposed solution to the conciliatory government policies on ethnic minorities is not too different from the policies after all. For Jiang, embracing the rhetoric of ethnic intermingling (ronghe—the ideology abandoned during the Cultural Revolution) as a way to construct its “national character” enables China to put forth a new world order to subvert western hegemony while averting the racialist practices the novel critiques. It is in this light that the imperialist excess of China’s interest in worldwide energy and resources as a global power can be concealed by the noble image of the nation as a promoter of world harmony under the discourse of (conciliatory) multiculturalism. The rest of the book analyzes literary texts that critique and resist the politics of conciliatory multiculturalism. In Chapter 3, Jin claims that Chinese American writer Alex Kuo’s work challenges the logic of multiculturalism in the U.S. and China, but also problematizes the convenient likening of national progress and ethno-racial equality in the U.S. and China. Jin argues that, by not proposing any specific solution to ethno-racial issues in both the U.S. and China, Kuo asserts that ethno-racial conflicts cannot be resolved with a radical reconceptualization of the existing nation-building project in both nations. More specifically, he proffers a methodology, which Jin describes as a form of “‘comparative critique,’ through intensive reflections on the entangled political implications of metaphor and its cognates” (106). The comparative critique in Kuo’s work enables a deconstructivist study of Chinese American literature not specifically assigned to any political or cultural center, be it China or the U.S. China, in this approach, is set in motion “in its various historical incarnations, as an object of intellectual inquiry and an integral part of American and Chinese American histories” (108). For example, Jin argues that by contrasting the U.S. Indian policies from the nineteenth century and China’s modernization policies in ethnic regions during the Cultural Revolution in Panda Diaries (2006), Kuo critically reexamines the geopolitical implications of both Chinese and U.S. nation-building as projects that homogenize respective national spaces. Yet, Kuo’s juxtaposition of both countries’ nation-building histories proposes that the mapping of China’s modernization of its western regions onto the early history of the U.S. westward expansion is not a compatible one because such mapping of development projects across national histories and spaces only legitimatizes these projects’ “elimination of certain species, habitats, and races from a modernized national space” (116) as inevitable, whereas, in reality, such projects actually “[encroach] on the world of indigenous peoples” (125). Similar to the novel’s demapping of national development projects, Panda Diaries reflects on animal metaphors such as the reindeer of the Oroqens in China and the bison of the Native Americans in North America, to stage the failure of metaphorical equivalence between the two ethnic groups. The excess in meanings and significations deriving from the mapping and proliferation of metaphors in the novel is the outcome of Kuo’s engagement with “cognitive demapping” (128), a literary trope that destabilizes existing metaphors and engages with “the idea of trading places as a process of creating new connections and generating new metaphors” (136). This trope facilitates the practice of “comparative critique” to resist treating the political inferences of metaphors as fixed and essentialist. One point to note about Kuo’s work and its productivity is that by uncovering the entanglements between American and Chinese histories, he recasts Chinese American literature as a critical site or nodal point (“switchboard” as Jin calls it), “through which different local histories intersect and gain new meanings” (109). Chapter 4 presents another critique of conciliatory multiculturalism by pinpointing how histories of ethno-religious conflicts challenge and reshape China’s ethnic policies and U.S. liberal multiculturalism. Jin argues that the rhetoric of multicultural harmony in both countries repeatedly filters the significance of ethno-religious conflicts from national consciousness; instead of addressing the violence spawned from ethno-religious conflicts, conciliatory multiculturalism practiced in both countries pays lip-service to ethno-religious difference in order to avoid charges of discrimination and imperialist exploitation. Here, Jin compares Zhang Chengzhi’s History of the Soul (1991) with Rabih Alameddine’s Koolaids: The Art of War (1998). Both novels reconsider the role religion plays in secular politics: History of the Soul focuses on the uprising of the Hui Muslims in northeast and southwest China against the Qing imperial government to rethink ethno-religious conflicts in contemporary China; Koolaids reconsiders the complex history of the Lebanese Civil War and religious, racial, and sexual struggles in 1980s and 1990s America. Recognizing the structural limits of U.S. liberal multiculturalism and China’s ethnic policies in accommodating radical ethno-religious difference, Zhang and Alameddine simultaneously suggest creative ways to reconceptualize the scope of multiculturalisms in the respective nations they criticize “by breaking down the conceptual opposition between religion and secular politics” (142). By rewriting and reinscribing the history of the Jahriya (a suborder of Sufism) into that of the ethnic and racial formation of the imperial Qing period and contemporary socialist China, History of the Soul forces dominant narratives of multiculturalism, such as ronghe, to engage and address the contested circumscription of radical religious difference by the homogenous collectivism of Confucianism, the political theology central to China’s political system in the Qing dynasty and official ideology in contemporary China. In so doing, Zhang proposes a model of pluralist universalism that Jin calls “competing collectivisms.” This model offers “a new vision of Chinese national identity grounded in the confrontations and mutual adaptation between competing notions of equality and freedom drawn from different theologico-political traditions” (157) to “[forge] a robust pluralism that not only tolerates radical ethno-religious communities but also incorporates them into the process of negotiating the terms of national identity” (160). In a similar fashion, Alameddine stages Islamic difference against Christian universalism by simultaneously critiquing extremist versions of Christianity and Islam through the explication of violence resulting from the Lebanese Civil War and the AIDS epidemic in contemporary America. Both Zhang’s History of the Soul and Alameddine’s Koolaids assert that ethno-religious conflicts should not be seen as disturbances to be subsumed under the dominant narratives of multiculturalisms. Rather, ethno-religious conflicts are active participants in the formation of political and social identities relevant to nation-building projects in both China and the U.S.; as such, both can help generate a broader conception of multiculturalism. Chapter 5 moves away from contesting collectivisms as alternate versions of pluralist universalism to a queer mediation of individual subjectivity as encountered in the competing multiculturalisms of liberal America and socialist China. Jin focuses on how the individual psyche factors into “neglected histories and scattered fragments of collective memories” in her analysis of Yan Geling’s Fusang (1996). In her comparison of the reception of the original text in China with that of the English translation (published in 2001 as The Lost Daughter of Happiness) in the U.S., Jin argues that the protagonist, Fusang, accommodates the violence that competing nationalist discourses (China and the U.S.) impose on her, which transforms her embodied subjectivity into a battleground for these discourses. In other words, Jin reads Fusang’s accommodation of the sexual violence forced on her by both her Chinese husband, Da Yong, and her white American lover, Chris, as queer practice that resists the normalization of her individual subjectivity into either a liberal or nationalist one, framed respectively in the translation and the source text. By excising the details of Fusang’s unruly sexuality, the translation contains Fusang within the racial discourse of the U.S., which uncritically assumes the (racialized) female body as the site of Chinese (patriarchal) nationalist victimization. In addition, the “erasure” of Fusang’s desires from the English translation also constitutes her character as more passive and vague, enabling western readers to read the novel as speaking with liberal undertones for the “voiceless” and helpless protagonist. Ironically, it is also the deleted passages in the translation that allow critics in China to regard Fusang as a “transparent signifier” to allegorically figure the racialization of Chinese immigrants in the U.S. since the mid-nineteenth century. China’s encounter with American imperialism in this context triggers two distinct domestic analyses of the Chinese text: (1) critics who celebrate Fusang’s literary accomplishment regard Fusang’s reaction to sexual violence as the survival instinct and a tactic deployed by Chinese immigrants (or Chinese values) confronting western imperialism; (2) those critical of the novel accuse Yan of fabricating a “self-orientalizing” narrative of China and hence perpetuating the unequal U.S.–China relationship. This split in interpretation among Chinese critics reveals that Fusang, the protagonist, cannot be easily read as a “nationalist desire to construct an indigenous culture as a counterweight to Western cultural hegemony” or as “a symptom of internalized orientalism [that] indicates anxiety over whether this hegemony can be dislodged” (182). Especially when compared with the reception of the English translation, Fusang presents a complex politics that takes issue with the competing nationalist and liberal discourses in U.S.–China relations, suggesting a different “tactic of survival and resistance that turns the character into an unlikely pioneer of a new regime of subjectivity and relationality” (174). Jin concludes the book by reinforcing the concept of “strategic doubling” as a productive mode of comparison for her study of the two kinds of multiculturalism practiced in China and the U.S. Not only does such comparison avoid the promotion of “banal universalism” (201), it also “[destabilizes] the boundaries between diasporic Chinese American literature and U.S.–Chinese comparative literature” (202), generating exciting and insightful dialogues on issues of both local and global concern. Pluralist Universalism is a significant contribution to the field of Chinese studies, Chinese American studies, and Comparative Literature. More important, as ethno-religious tensions in China heighten with the recent violent attacks at the train station and farmer’s market in Ürümqi, and the international controversy over the Chinese government’s recent sentencing of Beijing-based ethnic-Uyghur economist Ilham Tohti to life in prison, Pluralist Universalism opens up fundamental discussions on ethno-religious relations many of us have tiptoed around by treading the ambiguous path of political correctness. See Barry’s Culture and Equality: An Egalitarian Critique of Multiculturalism (Harvard University Press, 2001); Gunew’s Haunted Nations: The Colonial Dimension of Multiculturalisms (Routledge, 2004). Jin borrows the term from Bhikhu Parekh’s Rethinking Multiculturalism: Cultural Diversity and Political Theory (Harvard University Press, 2002). Jin’s analysis of Jiang’s novel is based on the original Chinese text, not the 2008 English translation by Howard Goldblatt titled The Wolf Totem. See Mignolo’s Local Histories/Global Designs: Coloniality, Subaltern Knowledges, and Border Thinking (Princeton University Press, 2000). See Critical Han Studies: The History, Representation, and Identity of China’s Majority, edited by Thomas S. Mullaney, James Leibold, Stéphane Gros, and Eric Vanden Bussche (University of California Press, 2012); Visuality and Identity: Sinophone Articulations Across the Pacific, by Shu-mei Shih (University of California Press, 2007); Sinophone Studies: A Critical Reader, edited by Shu-mei Shih, Chien-hsin Tsai, and Brian Bernards (Columbia University Press, 2013). The bombing and knife attack at the Ürümqi train station on April 30 killed three and injured seventy-nine people while the attack at the farmer’s market on May 22 killed thirty-one and wounded ninety-four.